Within its own fiefdom, this high-rise property with more resort amenities than any other property in the area—including tennis courts, a full-service spa, and a golf course—presides over Hutchinson Island, five minutes by water taxi from River Street and just a short drive over the Talmadge Bridge. The adjacent Savannah International Trade & Convention Center is what keeps the hotel at high-occupancy levels almost year-round, because many meeting attendees stay here; vacationers predominate on the weekends. The Savannah Harbor Golf Course is open to the public and is the best bet for golfers staying in the Historic District. Ferries depart every 15 or 20 minutes, with the last one heading for the island at midnight. If you miss the last ferry, water taxis are about $7. In-room fitness equipment is an extra charge. Room options range from the standard Traditional room all the way up the line to a Champion's Suite (not available for online booking; call to request this palatial suite). Regardless of your budget and selection, each room blends modern minimalist design in warm woods and soothing tones with traditional Southern accents. Guests tend to sleep well on the trademark Westin Heavenly bed, enfolded in gentle sheets and downy cushioning atop a luxe pillowtop mattress. 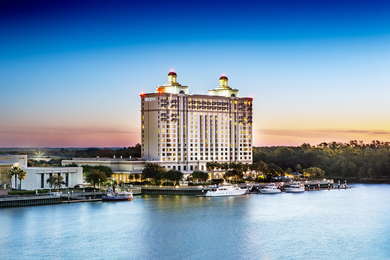 Unless you prefer the bucolic golf course view, ask for a room overlooking the river and stunning downtown Savannah. Bathrooms at any Westin property are kept to high design standards in cool slate and marble. 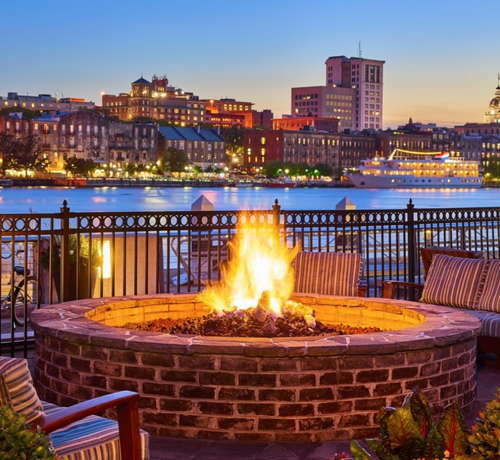 The Westin Savannah Harbor is no exception. Take a relaxing soak in the deep tub or revive yourself with the hydrotherapeutic shower fixtures before snuggling into a plush Heavenly bathrobe. As central nervous system to the entire hotel, resort and spa operation, the lobby is a world unto itself. Pop into the gift shop, chock-a-block with Southern charms, or grab a latte and pastry from the Starbucks Cafe at Midnight Sun on your way to the ferry downtown. 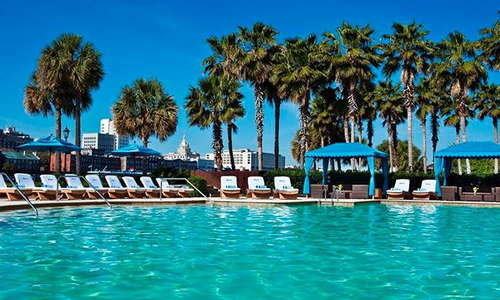 Arguably the best pool in Savannah proper, the entire recreational area overlooks the Savannah Harbor from its southern perch on Hutchinson Island. There is plenty of splashy play area to divert the kids while the adults decompress with a well-crafted cocktail and light bites from the poolside bar and grill. 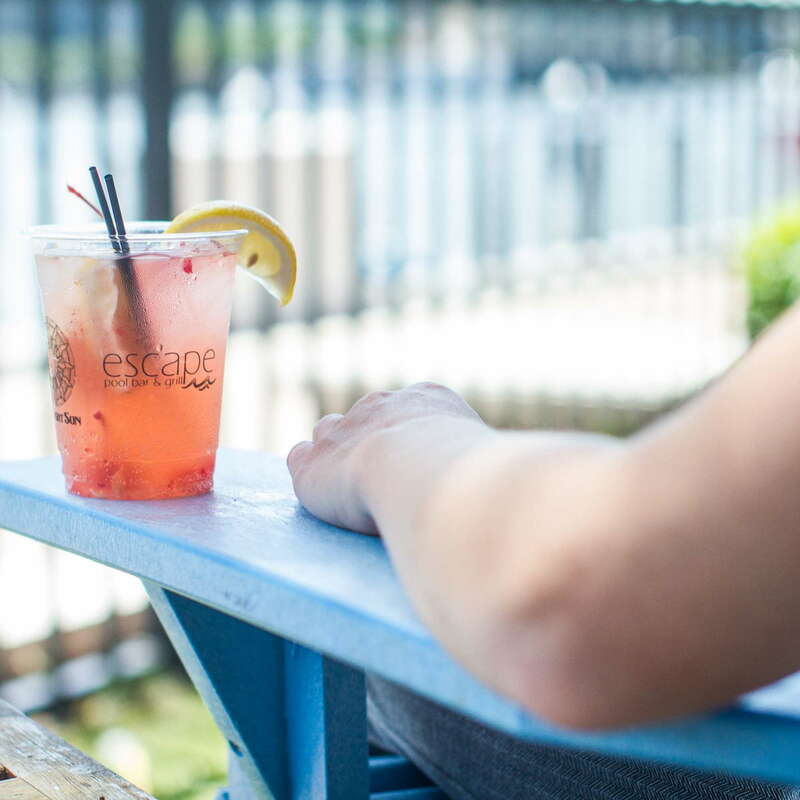 Get there early to stake your claim to a lounge chair during the busy summer months. Even the locals ferry over to the Heavenly Spa by Westin for the world-class spa services and to enjoy a touch of home, like Savannah Bee Company products and all-natural peach cobbler body souffle. Opt for the decadent in-room spa treatment if you really want to live it up. When the going gets tough, the tough get going to the fitness center - which is at the Golf Club, about a 7-minute warmup walk or cool-down shuttle ride from the hotel. There's also an 18-hole PGA Championship Golf Course. YOU SHOULD KNOW The fitness center is relatively small. Try to fit in your workouts during non-peak hours. Sunday jazz brunch at the acclaimed Aqua Star Restaurant overlooking the Savannah Riverfront is a local tradition. Dine on fresh local catch in haute cuisine style with unique Savannah flair. If you get peckish on the course, you can stop into the Champion's Grill for an Arnold Palmer and a light lunch. The Midnight Sun Lounge is well-stocked but fairly unremarkable as far as hotel bars go, besides a fun Johnny Mercer theme to its drink menu and the outdoor spaces. The champagne selection is vast and expertly curated. Parking is plentiful and safe at this hotel. There are free bikes to use on and around the resort grounds, but a journey to downtown Savannah requires either a car trip across the bridge or the easier, more fun option: a free 5-minute ride across the river on the Savannah Belles Ferry. Ferries arrive every 20 minutes. Vic's on the River (13-minute drive) is among the best fine dining restaurants along the Bay Street/River Street corridor. The Louisiana-inspired seafood dishes and views are outstanding. Order the crawfish beignets. For a fun family dinner, try the high-seas-themed The Pirate's House (16-minute drive). Or for a truly unique world-class fine dining experience, try to get a reservation at The Grey (8-minute drive). The award-winning art deco eatery, housed in a former Greyhound station, is one of Savannah's true culinary gems. The best place for discovering new beers while soaking up the southern sun is the beer garden at Moon River Brewing Company (10-minute drive, or 5-minute ferry ride and 5-minute walk). 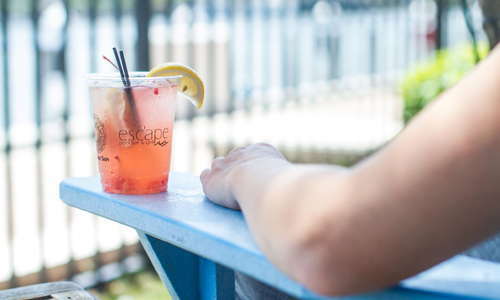 Make a request at Savannah Smiles Dueling Pianos Bar (10-minute drive, or 5-minute ferry ride and 2-minute walk) and grab a drink: you're in for a raucous good time. Golf buffs will rejoice at the Westin Savannah Harbor Golf Resort & Spa - a little slice of heaven to keep the whole family individually entertained but safe and close. 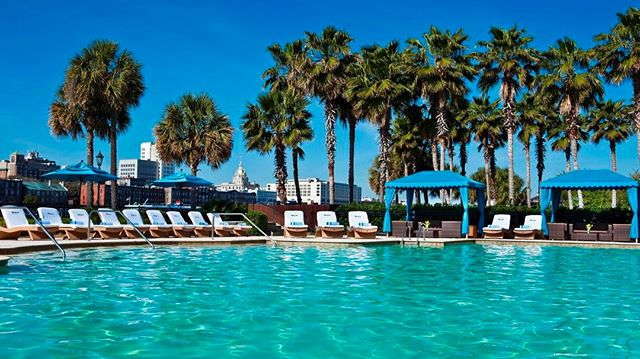 We love the pool and spa, which make for a perfect little retreat from the hustle bustle of downtown Savannah.